Lightspeed has produced some really exceptional special issues over the last few years, including the groundbreaking Women Destroy Science Fiction and Queers Destroy Science Fiction issues. 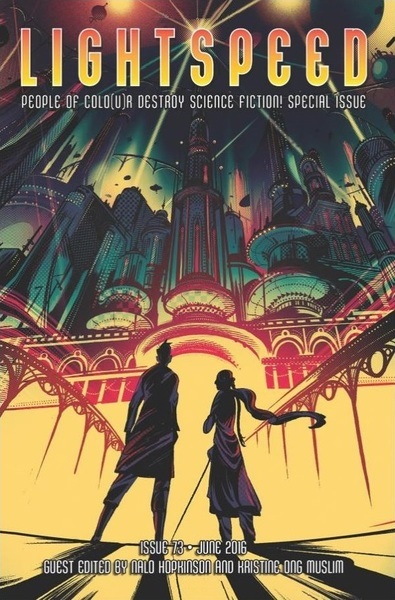 June sees the People of Colo(u)r Destroy Science Fiction special issue, weighing in at a massive 464 pages. It was funded by a hugely successful Kickstarter campaign that wrapped up on February 20, and is guest-edited by Nalo Hopkinson and Kristine Ong Muslim (original short fiction), Nisi Shawl (reprints), Grace L. Dillon (nonfiction), and Sunil Patel (personal essays). 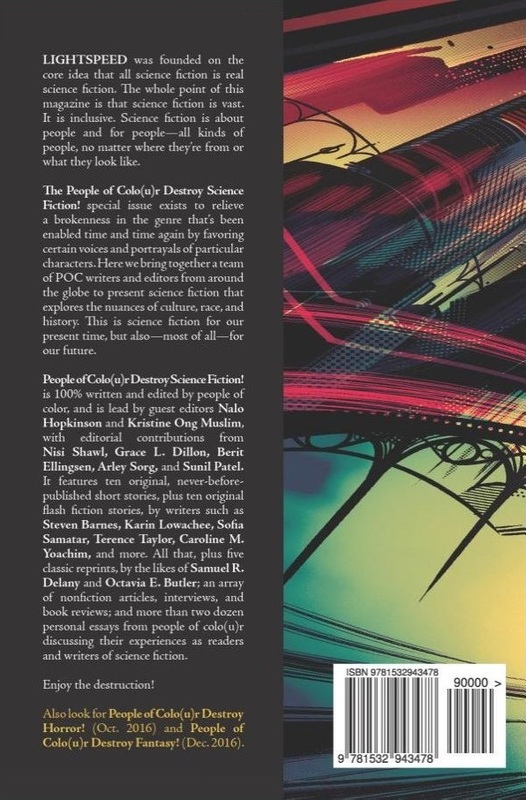 Even folks who didn’t contribute to the Kickstarter get to share in the benefits, as much of this issue’s massive payload of fiction is already up and freely available at the Lightspeed website — including brand new stories by Sofia Samatar, John Chu, JY Yang, S.B. Divya, and many others. But that’s not all…there’s also a rich assortment of paid content — including original fiction, a novella, flash fiction, reprints, and much more — available to backers, and anyone who purchases the digital edition for just $3.99. This issue is also available in a special trade paperback edition, with all the bonus content, for $17.99. Here’s the complete Table of Contents. Read the complete online contents of the June issue (issue #73) of Lightspeed here, and see a handy summary of all the Lightspeed and Nightmare special issues here. The cover art this issue is by Christopher Park. Lightspeed is edited by John Joseph Adams. Most of the content is available free online; individual issues are available in multiple digital formats for $3.99. 6-month subscriptions are just $17.94 ($6 off the cover price), or $35.88 for 12 months ($12 off the cover price). The June issue, weighing in at 464 pages, is also available in trade paperback for $17.99. Purchase copies and sample free content at the website. We last covered Lightspeed with Issue 72, May 2016. Check out Lightspeed‘s sister magazine Nightmare, also edited by John Joseph Adams. See our June Fantasy Magazine Rack here, and all of our recent Magazine coverage here.